This is the last of the weekly series of articles about the history of the Marcellus Library. Additional articles will appear occasionally in the future. One of the tiniest, most delightful treasures found in the Marcellus Township Wood Memorial Library’s archives is a pocket calendar for the year 1903. 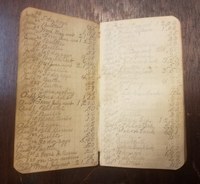 It no longer has a cover, and measures 2½“ x 5.” Its 59 pages are covered, on both sides, with tiny entries written in pencil -- approximately 27 entries per page – listing the income and expenditures of library benefactor Russell Wood’s mother for the years 1906-1912. These were years when Russell Wood and his parents lived on a farm near Edwards Corners, not far from Marcellus. The little notebook reveals that Mrs. Wood sold butter (approximately 20 cents/pound), cream, eggs (vary between 10 and 30 cents/dozen), wood, roofing, huckleberries, blackberries, apples (90 cents/bushel), asparagus, straw, cider, potatoes and chickens (5 hens for $1.92 in 1906). She also received monthly rent payments, possibly for land or barn use. She records monthly rent payments of $12.00 from “Terry,” and $19.00 from “Wood.” Mrs. Wood also received interest payments (perhaps from loans she made?). In March 1909 she received $9.00 from “Wallin int.” and $5.25 from “Holcomb int.” In September of the same year she received $3.50 from “Jimmie int.” and $5.50 from “S. notes and int.” That month she also found, and recorded as income, 5 cents! Small monthly credits from bank accounts are also listed. In 1910, Mrs. Wood received 35 cents from her Jones bank account. And in 1908 she recorded the receipt of ten cents listed as “Russell returned.” Apparently, even in 1910 teenagers borrowed from their mothers! tin on windows 10 cents. There are regular entries of 1 cent for Sunday School and $5.00 for church, as well as entries for “R. candy 5 cents” and “R. ice cream 10 cents” throughout the accounts. Presumably R. stands for Russell, who was 15 years old in 1906. Russell night dress 75 cents, 2 shirts and hose $1.18, gloves twenty-five cents. Russell shoes $3.00, overalls fifty cents, hat $1.50, underwear $1.50, pants $1.50. Although most expenses are for food and household needs, there are occasional special items such as: Hat pin and roses 30 cents, two yards cream lace 25 cents, hand bag and belt $1.10, perfume vel. rib. (velvet ribbon?) 46 cents, corset 50 cents, Cass County Fair 95 cents. At the very end of the notebook there are lists of expenses titled “Cost of Building.” This section includes lists of payments made to Ralph Romig, Orrin Waugh, Carl Buck, Fred B. and Mr. Miller, presumably the building crew. The average payment per day is from $1.25 to $2.00. There is also a chart showing that Mrs. Wood made 118 pounds of butter on 44 days between January and July, 1906. At twenty cents a pound, she made $23.60 from churning butter on 44 days. The hundreds of entries in tiny cursive writing are fascinating to ponder, and exhausting to decipher. They are difficult to read without a magnifying glass. They give us a look into the early life of Russell Wood, and what this part of Michigan was like when he was a boy. Surely the hard work, astute bookkeeping, careful generosity and responsible approach to life reflected in these accounts can help us to understand why Russell Woods, at age 27, wanted to leave a bequest to Marcellus to build a library. We believe the significant sum he was able to leave was the result of the sale of the family farm near Marcellus, where his mother made butter, organized building projects, loaned and received back money, and took her son out for ice cream on a regular basis. Charity Wood’s diary is on display at the Marcellus Township Wood Memorial Library for the public to enjoy. A magnifying glass and bright light are provided!